Garstang set up a Macron Cup third round tie at Avro after beating Stockport Town on penalties on Saturday. Lee Baker’s depleted squad came from two goals down to draw 2-2 before winning 5-3 on penalties. The first half was a very drab affair with both sides showing promise but let down in the final third with little quality being shown. However, it was the home side who took a fifth minute lead when Gavin Salmon’s shot sneaked into the corner of net via the woodwork; an effort which, on another day, keeper Dan Curwen would have collected. The lead could have been further extended but Curwen, deputising for the suspended Will Kitchen, made a great stop from close range and saw the rebound missed. Although the game was even in midfield with Shaun Sailor making a lot of runs down the right, Garstang were unable to create any clear chances. The best one fell to Kieran O’Connor, whose header from a corner was saved by the home keeper as Garstang trailed 1-0 at half-time. The Riversiders upped their game in the second half with Ben Roberts being introduced down the left to give Garstang the ability to get behind the backline. He did well on a number of occasions, beating his man, but no one was able to connect with any of his crosses. The home side was always dangerous on the break and, on one of their counter attacks, Cameron Ross was cautioned for a foul with the free-kick curled over. Stockport extended their lead further on 54 minutes when a quick attack down the centre ended with Curwen making a fine save, only for the dangerous Matthew Hanson to sidefoot home the rebound. Baker brought on Tom Graham to add some energy into the midfield and the deficit was soon halved when a free-kick came off the head of a Stockport defender and went over the keeper. 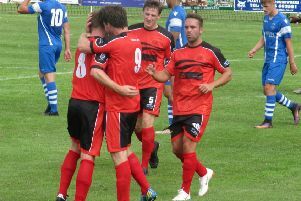 This energised the Riversiders as Roberts tested the home keeper and Billy McKenna was unable to fire home the rebound. The home side could have scored again when a 25-yarder hit the top of the bar with Curwen well beaten but Garstang equalised when Tom Entwisle curled home a free-kick with 14 minutes left. With the score 2-2 at full-time, it meant a second straight penalty shootout with Entwisle, O’Connor, Jonny Hothersall, Graham and Jack Bennett all scoring. Curwen had made a fantastic save on the home side’s fourth penalty, setting up Bennett for the winning spot-kick.